I have been working away on my cobra and currently up to paint and assembly. Thought i would post up some pics of the progress. Its really starting to come together now. I had a lot of trouble with getting coverage with the blue pearl. Its a tricky colour because the pearl hides the lack of coverage from some angles, making it difficult to spray if the light isnt perfect. Im reasonably happy with it now. The parts you can see in the photos that are a bit thin are just the parts that get covered by the body and these will have foam tape on them any way. 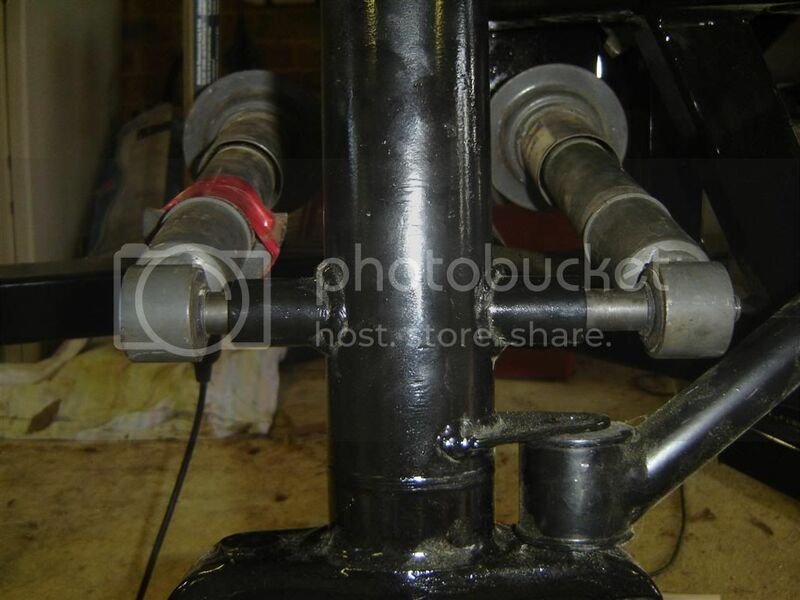 I havent got the front rear shocks installed in these photos so the bits of metal on there as spaces will be removed when i get another pair of shocks. I am using trailing arms on the rear. I know a lot of people think they are unnecessary, but the RTA frown upon leaving bits out of the Jag rear. 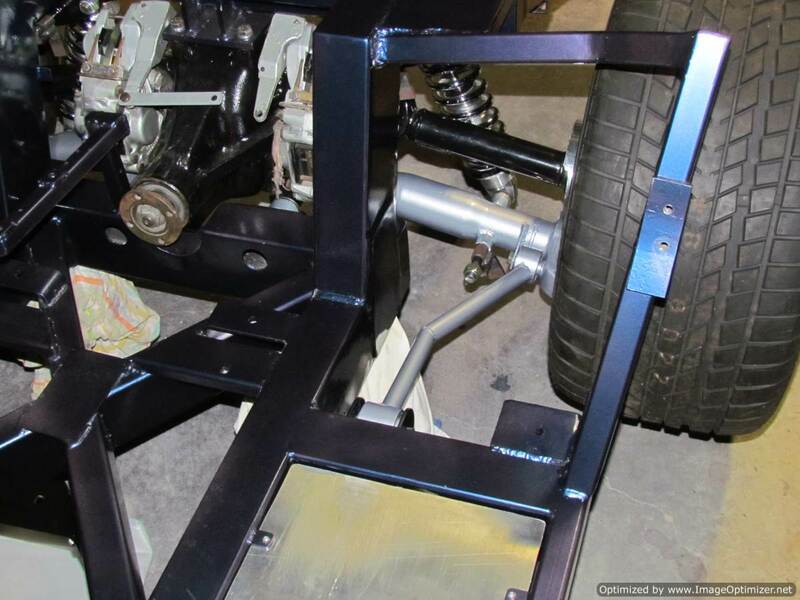 The trailing arms are Jag bushes on the rear and nissan patrol upper trailing arm bushes on the front. Suspension moves freely without binding, whick i was glad about after spending a day making up the arms. Looking great Liam. Congratulations. It can be done. My only concern is the trailing arm design. It would put quite a lot of twist into the bushing and the arm as the suspension goes through it's travel. It might make the bushing fail prematurely or fatigue the weld. I would make the arms with a spherical bearing or a heim joint on one end to let the end rotate freely whilst maintaining alignment. 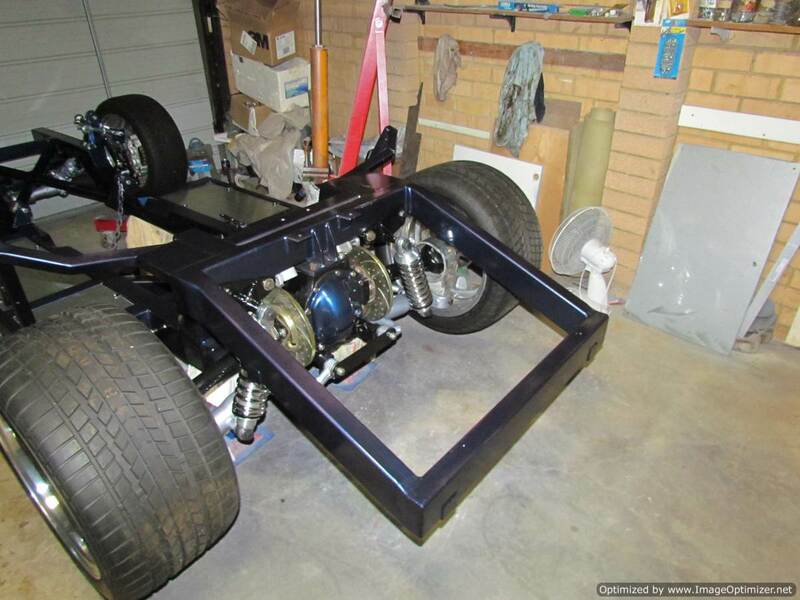 You would still have some rubber isolation from the chassis with a bush on one end so should be OK for rego. I would also make them from one straight section of tube rather than putting a kink in them. There's plenty of clearance there. 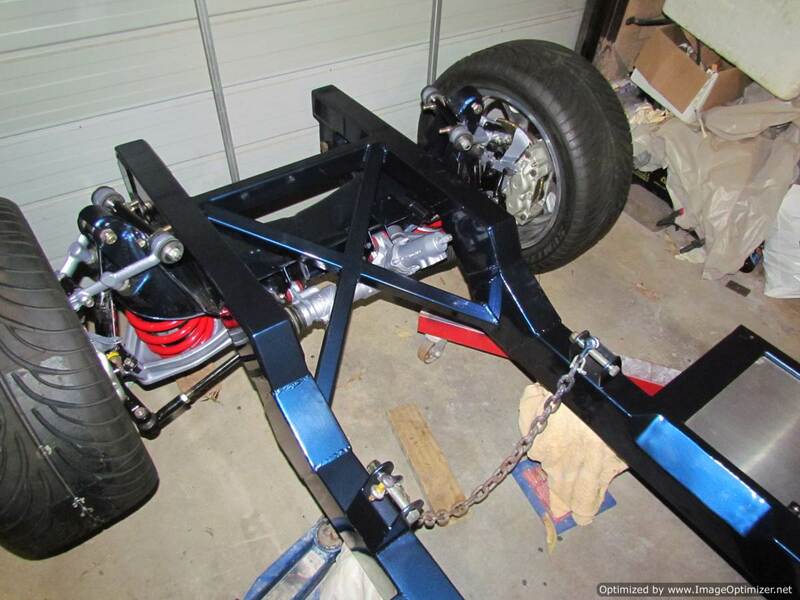 The other thing, with the location of those chassis mounts you are going to get some change in rear toe as the suspension moves up and down. The pivot really needs to be on the center line of the lower inboard control arm mount so you can draw a triangle through the 3 points. The arc the trailing arms currently move through will push the wheel forwards and back through it's travel butting some loads on the lower pivots. 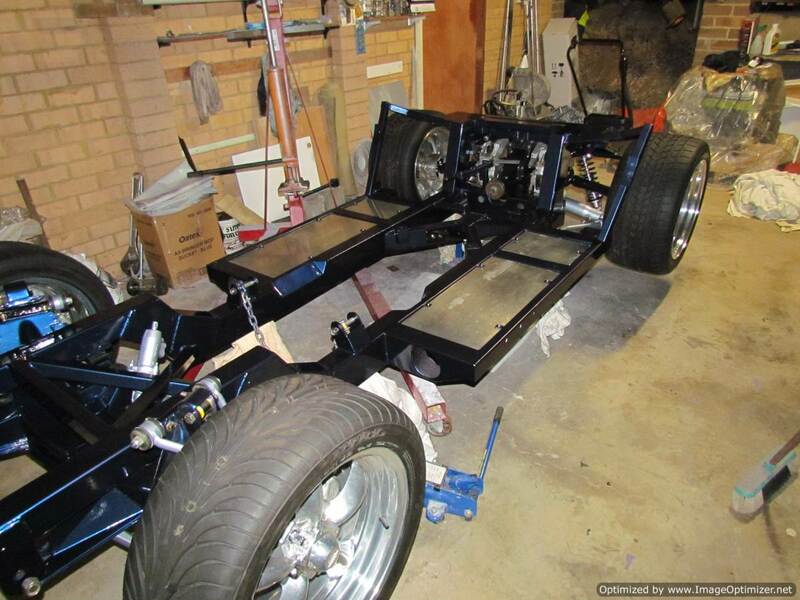 Last edited by Aussie Mike; 10-04-2011 at 03:50 PM..
You could maybe swap left and right dog bones and run the trailing arms back to the rear of the chassis. That way you could put the mounts on the center line of the inner pivots. This would depend on the design of your fuel tank of course. I was concerned about those points also. I spent a lot of time exploring options by looking at other cobras, and also a lot of hot rods. Also drew up a few sketches to calculate the displacement caused by the arc for various trailing arm lengths. The ideal situation is to have long arms that intersect with the axis of the inner fulcrum on the control arm. These virtually have to mount halway down the car next to the gear box (or to the rear of the car). 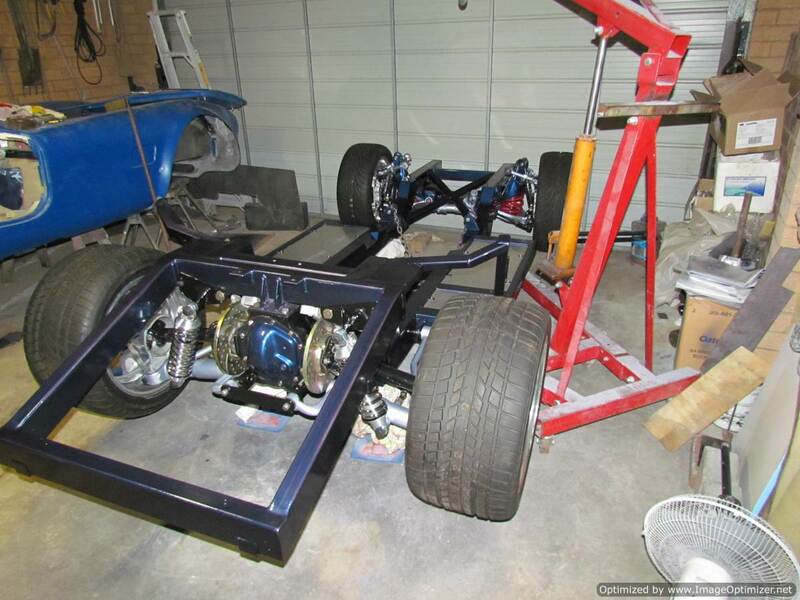 This works on a hot rod but no chance on my chassis without hanging below and limiting ground clearance. Laurie (RCM) said that he used to use the jag arms modified to run on an angle by cutting them and rewelding. I chose not to use the jag arms because i dont like the look of them and i already had the parts to make my own, but apparently that works ok. I considered Rose joints but thought they wouldnt provide enough movement to compensate for the arc and hence cause toe in. I couldnt run the arms straight cause they would clash with seat mount and exhaust holes in the chassis. I also considered going rearwards except the fuel tank gets in the way and there would also be no room for undercar exhaust. With the shocks removed i can move the suspension through the full travel without any binding or noticeable drag so i dont think there will be any bump steer issues. Durability of bushes is a concern though. Only time will tell how this goes. If the jag bushes wear out i can replace them with Rose joints quite easily by just cutting and welding in a bung to the tube. The patrol bush on the front provides a lot of flex as these are used on arms about 2/3 the length of mine and there is double the travel on 4x4 suspension when compared to a cobra. The tube for the rear bush is welded on at a slight vertical angle so as to match the angle of the control arms at ride height. I think it should be ok. Only time will tell! Following Mike's note the G-Force run a long bar forward with the front using a bush but the rear at the suspension a heim joint as Mike suggests. Obviously setting up the brackets and frames might be an issue on your design. Also a question on your rear brake attachment bolts, are the nuts you used nylocs or the special binding style you really need to use to avoid the plastic melting in the nylocs under braking? Obviously if you need to change them now is the time whilst they are very easy to access. I'm curious why you cut and welded the trailing arms? Seems you would lose some rigidity? Plus if the mounts are bushed, it looks like they would bind through travel. I would think a straight link with heims would work better. Last edited by Ralphy; 10-04-2011 at 08:13 PM..
Not sure what you mean by brake attachment bolts. Do you mean the nuts that hold the brake disc and half shaft flange? The nuts are a special type of crushed nut that are sort of sqashed at the top to make them lock. 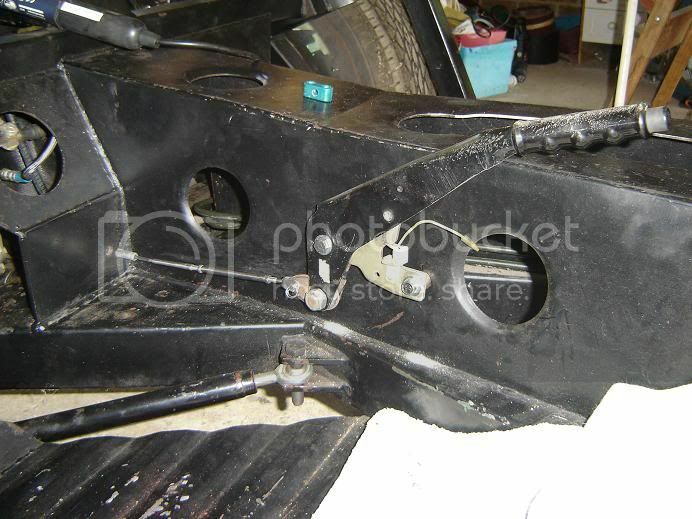 You cant see it in those photos, but there is a hole throus the chassis for the exhaust to pass through. They are not regular bushes they are trailing arm bushes which allow twist the same as a heim joint. This is a video i took. i am lifting it with 2 fingers whilst holding the camera with the other hand...no binding! Last edited by Zedn; 10-05-2011 at 02:04 AM.. Yes your assumption about what I was getting at is right and you've used the right nuts by your description. Just looked like nylocs in your picture and I'd have hated to not have mentioned anything had they actually been nylocs in regards to the risk of failure down the track when you do get the beast up and rolling. Frame looks good and makes me want to go source a replacement diff cover to have it sprayed up in one of the body colours I'll be using. Might be a bit odd though against an all black chassis and not visible anyway. I'll settle for a running car at this time. Yes, i went to my bolt shop and told them i needed lock nuts that could handle high heat. That is what they ordered in for me. I also replaced the bolts with new ones to be on the safe side. The other bolts on the rear end have been tied with safety wire and locktite'd as well. I have gone a bit trigger happy with the spray gun as you can see. I know it wont be seen but i couldnt resist. Will probably end up having to strip it all down and do it in black after a couple of years, but its fun for now. Liam, I've gotta agree with the others. I've looked at your vid and whilst the lower arm seems to move smoothly without bind it is a whole different ball game when aggressively accelerating or braking. My RMC (like the G-Force) has a longish straight trailing arm which seems to work ok with an adjustable heim at one end if adjusted properly. But I'm not overly in favor of it. For what it's worth the following pic shows the only system I feel works adequately to relieve the forces on a Jag lower arm in our cobras. I was going to suggest a Watts linkage setup but I'd only seen them with an attachment to the top of the Jag upright. That's a neat setup in your pic there Les. It could be set up as a bolt on to Liam's existing chassis. Mike, I really don't like the watts linkage set to the top of the Jag upright. Being fitted to the top of the upright I feel it doesn't really prevent movement of the lower arm. 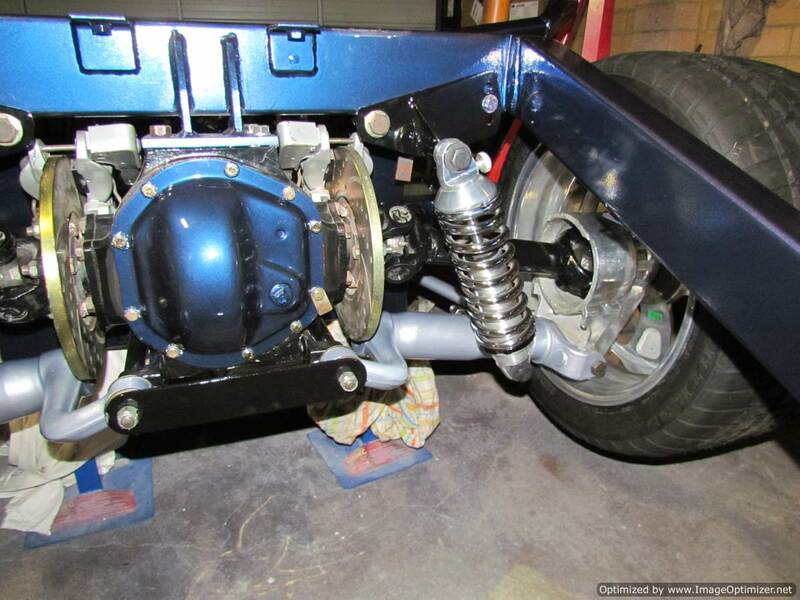 That watts link in the pic is on a DRB and if set up properly, it wont bind for the full travel of the suspension. The owner used to hang in here on CC but I've not seen him for a while.. The other nice thing of that link is that because the load is taken between two arms, one in tension and one in compression then the components can be somewhat less bulky than a single arm. I really don't like the watts linkage set to the top of the Jag upright. Being fitted to the top of the upright I feel it doesn't really prevent movement of the lower arm. Good call! The Watts link at the top of the hub carrier is for stopping torsion of the lower control arm (LCA) under load, not for fore-aft stabilization of the LCA. I, too, like the way this guy set up the Watts link on the LCA... and I am considering something like this for mine . Took me a while to find suitable pictures but here is the G-Force version for your information. Guessing you're too far down the track for change but it doesn't hurt to see how other kits manage the same idea. Plus I have some understanding of the geometry planning needed here but no experience and I can only hope GF have it right. Other GF owners are not complaining so it can't be too far wrong. Please tell me if I am wrong. The forward link you have arrests the wishbone from moving forward during acceleration. This induces a rotational twist in the wishbone (a lever), looking from the drivers side the wishbone would be stressed in a clockwise direction. 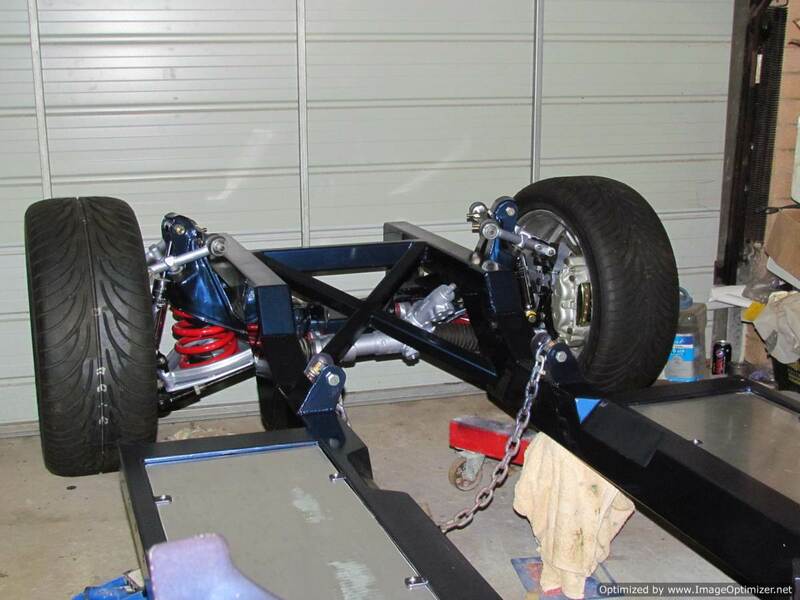 If you added an upper link the force on it (the upper link) would be toward the rear of the chassis. Not having an upper link allows this twisting to go on. 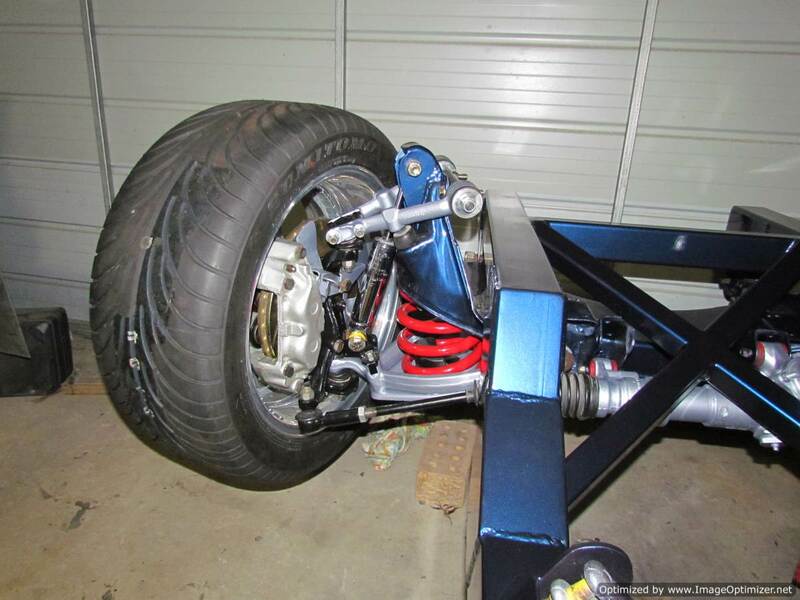 So, having your coilover to the rear adds even more torque (twist) on the wishbone, putting the weight on the back. Your coilover would serve a better purpose being toward the front of the halfshaft, counter reacting under acceleration. Also, when a chassis flexes the further back you put the coilover. The amount (distance) of travel is greater when flexing. So again the coilover serves better to be forward. Am I wrong? The flex will occur at sudden acceleration or braking so it goes both ways. That being said we are talking about a 5mm wall pipe that is not very long and in my case it is sleaved with another 5mm pipe. There are 2 areas on the Jag rear that spark a lot discussion. 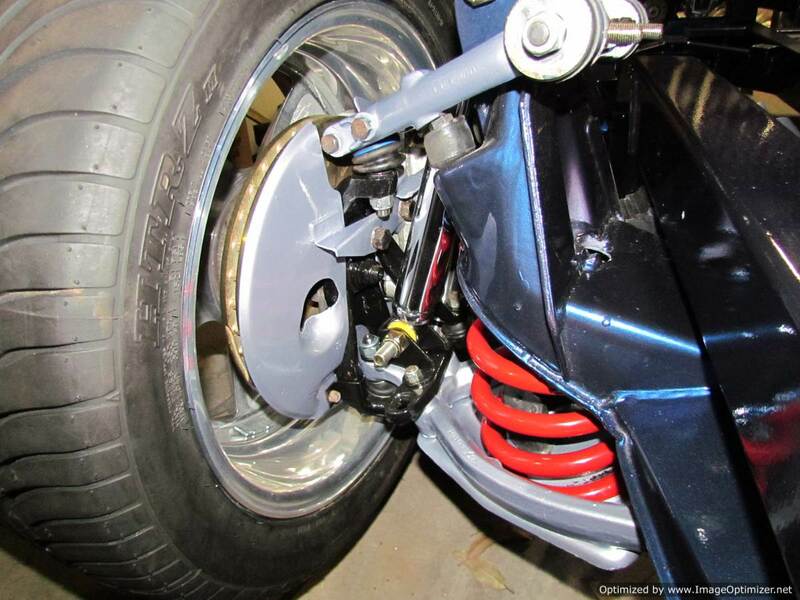 One is the trailing arms and the other is as you have raised, the shocks. I will be running shocks on both sides as they are in the jag. In other words there will be 4 shocks when finished. I have a G-Force and it is like Slowy's - it essentially turns the dog bone into a wishbone, putting it in compression under acceleration, but as you can see on Zden's chassis it is not possible to do this as a chassis member is obsucting it. The single shock set up on the red chassis is mounted forward of the arm, and i have been considering going that way with mine. I really like the adjustable shock mounts on the RCM. I mighty try and retrofit to mine. My spring rates are just right but they are set at the lowest height on the spring seats and it is still to high in the rear. Liam forces do go both ways, however considering rear brakes at best offer 25% of your braking force vs. acceleration at 100% rear. Plus the rear unloading during braking there is no comparison. I also wondered if you were to add front coilovers. In your pics I see no upper mount.